Today, dear readers, you will thank me for sharing the best (THE BEST!) chocolate cake recipe in existence- the last chocolate layer cake recipe you will ever need. Let’s not argue over who’s chocolate cake is best, or what bakery makes the best chocolate cake, or who’s mom, aunt, or grandma has the best chocolate cake recipe known to mankind, or better yet- which famous company has the most delicious chocolate cake mix you’ve whipped together (we’ll talk about boxed cake mixes in another post). Argument is not needed after taking a bite out of this cake. I promise! 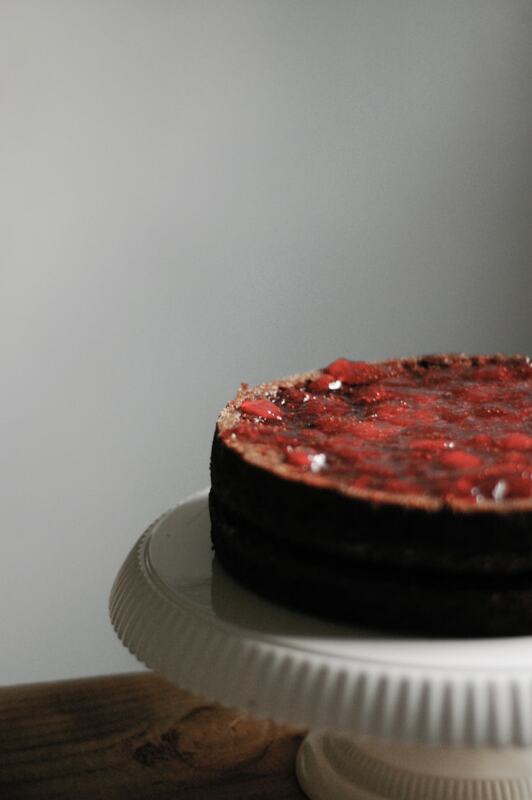 Once the first piece of this chocolate cake hits your taste buds, you will have some sort of unexplainable religious experience- yes, all because of this strawberry & chocolate layer cake recipe. You see, my birthday was on Friday, and I needed an excuse to post a cake recipe- I know, I just used my birthday as a very relevant excuse to post a cake recipe. Sue me! Oh and before we all go nutzo over me making my own birthday cake- I promise you, I did not make my own birthday cake- A couple of cakes were actually made for me, and honestly, they couldn’t even top this recipe. Why? Because the cakes (with the exception of one) did not have a beautiful, moist crumb that would make any cake lover (hell, any baker, as well!) swoon. You know something? There is nothing worse in the world than dry cake. It makes my inner baker shudder to the nth degree. Dry cake makes me want to cry. Dry cake makes things that you are looking to cheer up with cake, even worse! Take my word on it! I think some new bakeries (not all of them!) have been plagued with the thought that everyone is looking to enjoy beautiful, elaborately designed cakes- cakes that are almost inedible because they are covered with unnecessary amounts of horrid tasting fondant. Bakeries- I don’t care how beautiful your cake is, how amazing that fondant is making the edges of the cake look breathtakingly clean, if your cake tastes like you replaced the flour with sand, I wouldn’t be a happy camper. Some people might, but that’s because they’re letting the look of the cake get to them! I’d rather much have a not-so-breathtakingly-clean looking cake, and have it be the most delicious cake on the planet. This chocolate strawberry layer cake, will do just what some other cakes don’t do- it will make you dance until you drop! It will make your taste buds sing until they can’t! It will make you want to kiss the nearest person to you (or your cat)! It will . . . I don’t know what else it will do, but it will definitely do this: it will make you happy! And trust me on this, you’ll get a lot of happiness out of this recipe! 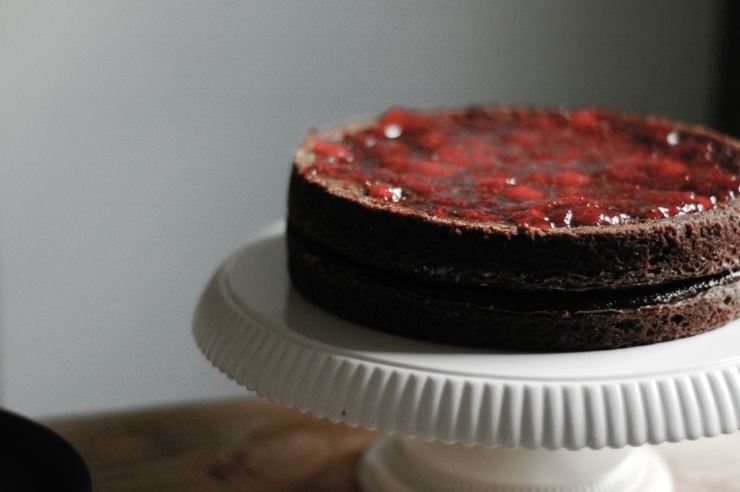 Layers of strawberry jam, smooshed down by ever-so-moist layers of chocolate cake, and a healthy helping of frosting spread on the cake will make anyone smile- no matter on what occasion it is. I have seen people in the biggest depression go back into a state of happiness because of this cake. So, enough of my bragging about how amazing this cake is- I’ll let you get to baking. 1. Preheat oven to 350ºF. Butter the bottoms and sides of three 8-inch round cake pans. Line the bottom of each pan with a round piece of parchment paper. 2. In a large bowl, combine the flour, sugar, cocoa powder, baking powder, baking soda, and salt. Set aside. 3. In a medium bowl, whisk together the eggs, buttermilk, vegetable oil, and vanilla extract. 4. Add the egg mixture into the flour mixture; beat on medium speed for one minute (or combine by hand to prevent over-mixing). Whisk in the boiling water (the batter will become thin). Pour into prepared pans. 5. Bake 17-22 minutes, or until a cake tester (or a wooden toothpick) inserted into the center of each cake, comes out clean. 6. Once the cakes are out of the oven, with a [dry] clean oven mitt (preferably a cloth one), gently press down onto the cakes, to make them level (this will allow you to skip a whole step in trimming the cakes). 7. Cool cakes for 15 minutes in the freezer. Meanwhile, make the frosting: In a large bowl (or in a stand mixer), combine the melted butter and cocoa powder powder. Alternatively mix in the milk and powdered sugar, beating (on medium speed) to spreading consistency. Add a tablespoon of milk, if needed. Mix in vanilla and light corn syrup. 8. Remove cakes from pans, and place on wire racks. 9. Place one cake on a cake stand (bottom side up) and spread half of the strawberry jam, being sure not to spread to the edges of the cake. Place the second cake on top of the first (bottom side up), and spread the remaining half of the jam onto the cake. Place the third cake on top (bottom side up). 10. Place the cake in the freezer for 10 minutes (this will make frosting the cake much easier). 11. Using an off-set spatula, spread a thin layer of frosting over the top and sides of the layer cake. Let the frosting set in the refrigerator for 20 to 30 minutes; then, spread a thick coat over the base coat. That cake just sounds perfect. Chocolate and strawberry is my favorite combination! Decadence in a cake pan. I love it! happy belated birthday to you Kamran – may the year ahead be filled with happiness, laughter, love and of course MUCH SUCCESS with your blog and starting college! HAPPY BIRTHDAY!! This looks SOOOOO fabulously rich! This looks delicious. Though I must admit, I’m drooling just as much over your cake plate as the cake itself. It does look fantastic! 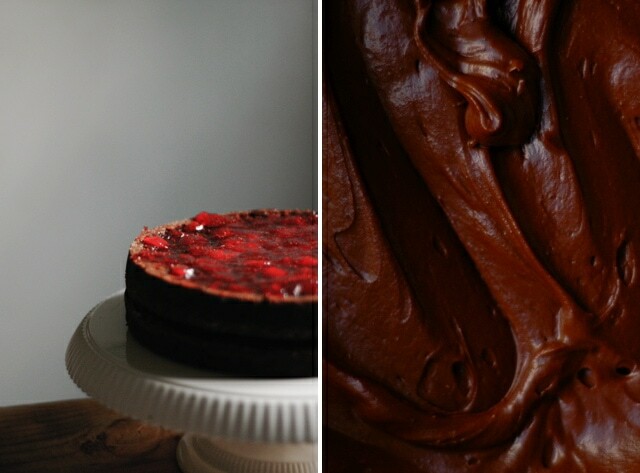 The recipe reminds me of my devil’s food cake – in the best way :). I love the strawberry addition, and that buttercream – it looks absolutely heavenly! You already know how I feel about the photos – you just keep getting better and better with them. How can you go wrong with that combination? This cake looks SO scrumptious. I’d buy from your bakery any day ;-) I hope to give this one a try. This looks so rich! I want to just dive in that frosting! The cake looks stunning, K! I’ve never made a chocolate butter cream frosting because the copious amounts of butter make me shudder. Maybe I will try with ganache. I’ll take you up on it. I am always looking for the BEST chocolate cake recipe. So I’m a gonna give it a try and holler back at you. (thanks). Happy belated. And, I always bake myself a cake for my birthday even if there are other cakes. Why? Mine is always best. Ha. Kare– Haha! Thank you! The cake stand is from the Martha Stewart Collection at Macy’s. Lauren– You are too sweet! Thanks for your kind words! DessertForTwo– Already letting out my secret to the super-moist cake! This cake sounds divine! I’m with you, I am all about the flavour of the food. It does need to look presentable, of course but it’s the taste that means the most to me. Is this your own recipe?? Another beautiful post, great work! And happy birthday from New Zealand! wow, what a fantastic looking cake! LOVE the photography here too – especially the top down shot with hands holding the cake. HAPPY BIRTHDAY and HAPPY GRADUATION! What a way to celebrate. I’m with you–dry cake is a sin! This looks wonderful. Sound decadently good…I’m a huge fan of chocolate and raspberries desserts but thinking I could be easily persuaded by this cake that chocolate and strawberries in a cake are equally to die for. I’m with Rachael…Happy Birthday and Congrats on Graduation. What a huge week for you! So I’m definitely one of those people who believe my mom’s chocolate cake is THE one, but your post has convinced me to try yours as well…mainly because I trust you and those photos couldn’t lie. I totally agree with you on fondant, by the way. I’ve never really gotten it (although I do love a good princess cake every now and again). Hi Kamran! Lovely blog you have here. Just one thing, if my husband isn’t a big fan of strawberries, can I substitute raspberry jam for the strawberry jam called for in the recipe? Alana– Thanks for your kind words! And I’m sure you could sub the strawberry jam with raspberry. Raspberries and chocolate work well together! So I don’t see why not. a) Happy belated birthday b) please don’t tell me it would be wrong to make one’s own birthday cake since I’ve done it many times! c) for my August birthday I will make this cake. d) Was wondering what to do with the strawberries I just bought, gonna make jam out of them for the chocolate cake. e) Thanks! Chocolate and Strawberries always go good together!!!! I love them both especially in a cake, yummy!!!! You are completely right. Decorating has taken center stage far too often. If it doesn’t taste great, why spend the money on it? I wished you Happy Birthday on Facebook and would like to wish them again here. What a beautiful cake. What an incredible looking cake. It looks so decadent and sinfully delicious. One Less Thing– thank you so much for the birthday wish- and it’s not wrong at all to make your own birthday cake- I make mine a lot, too! Also, for the strawberries- I’ll be posting a recipe for old-fashioned strawberry jam soon, but until then, I highly suggest that you try this recipe from my friend, Alice- you’ll love it! That is a picture perfect cake and I can just imagine how divine it tastes! Great job! P.S. 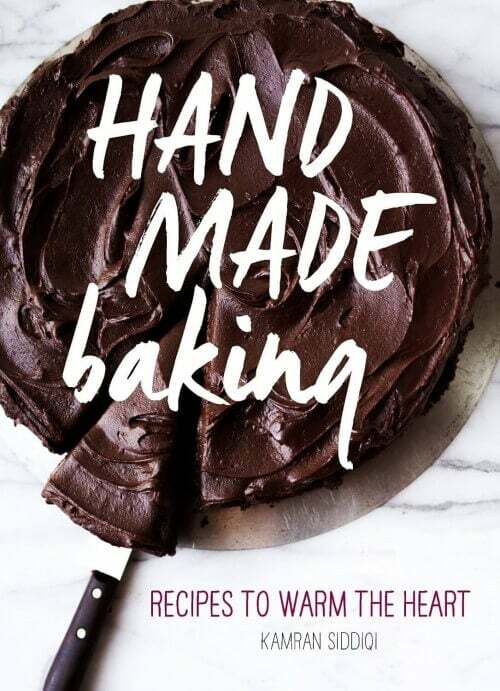 – I couldn’t make the recipe with the strawberry jam because I am allergic to strawberries, but I did happen to have just enough frosting to fill each layer of cake. Thank you so much for the amazing recipe! Really interesting use of the fridge and freezer here? Loved the close shot of the frosting! good one. best from Santa Barbara. Just discovered your blog today. (Thanks Tastespotting. )I don’t want to get too personal on my first visit, but it’s love at first sight! (I have multiple chocolate cake recipes in my “Favorites” that I can delete now.) Thanks for sharing “the best”! You are SO right! There’s nothing worse than biting into a gorgeous cake to find that it taste like crap. Even if the fondant doesn’t have a single crack in it. Lovely cake! While I love decorating cookies and cakes, I whole heartedly agree with you about how not-so-perfect looking cakes are very underappreciated. goodness gracious. 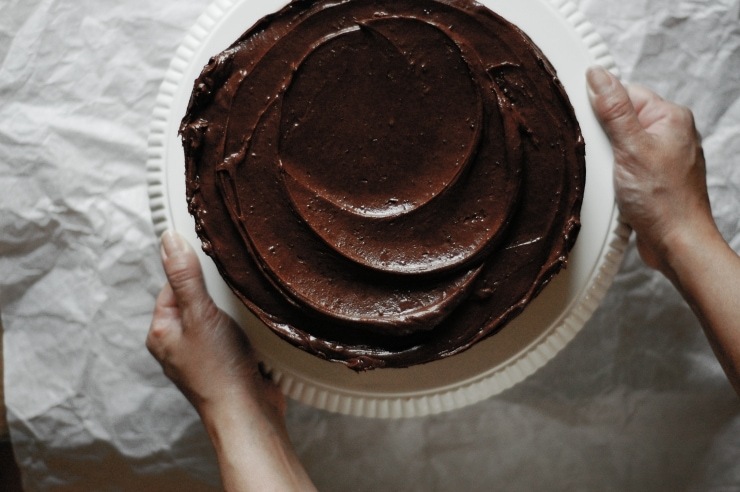 this chocolate cake doesn’t need to be decorated at all. Its perfect as is. very luscious and beautiful! Great job, Thank you so much for sharing the recipe. Belated Happy Birthday!! Everyone goes on and on about how _____ is the best cake ever, but somehow, I believe you, and am going to try this asap!! Yumm.. I usually run away from buttercream, but 1 and 1/2 stick doesn’t sound that bad! OMG! Your writing maks me SO wish I wsan’t diabetic. Oh, well. I just discovered your blog. You’re an amazing young writer! You’re now bookmarked on my desktop. 1) that frosting looks just like the kind I love. 2) My birthday is in November, and I haven’t had a homemade cake in decades (though I’m always making them for others). Can you make sure those professors don’t work you too hard around the 18th of November so you can make a special delivery. Subtlety is obviously not my strong suit. Oh my, Kamran! You’ve made me crave this cake just with your description of it. Now I simply have to make it. And you’re so right, a beautiful cake that doesn’t taste good is simply worthless. All the gorgeous fondant and decorations in the world can’t make up for a dry, tasteless layer. I am SO making this. Nom. Jennie- I’ll bake you a cake anytime of the year, friend! I used the icing for a three-layer chocolate cake yesterday, adding about a half teaspoon of cinnamon to create a little nuance in the flavor. It’s easy to make, works beautifully, pipes beautifully, is definitely a keeper. Next time I’ll double the recipe, however, since I wanted both jam and icing between the layers, this meant there just wasn’t enough icing for the cake itself. It IS very very good, very moist, definitely worth making. Hi Alana! Thanks so much for the comment! Glad you love my icing and what a great idea to add some cinnamon! I’ve got to try that! As for doubling the frosting recipe- I’d suggest it if you’re using 9″ cake pans or are piping on designs. I knew that there was at least 2/3 cup to 1 cup of frosting left when I was done with the cake…. Dry cake should be outlawed. It’s a dastardly thing. And I totally agree with you on fondant. That stuff is not for eatin’. It’s yuck. Yuckity, yuck, yuck. The cake looks delicious. I have a “bestest” chocolate cake recipe myself, but will certainly give this one a try. Is there a reason why you bake the layers in separate pans? I’m thinking of making this for my besties birthday, shall i do it? Can I substitute fresh raspberries instead of jam? or will i be missing out terribly? My antidote for dry cake is one generous tablespoon of dark rum poured onto each layer. It never fails! wow – this looks so divine and I’m totally with you on the over the top cakes in cafes – it’s just afternoon tea people, not a wedding! This is bookmarked for my next afternoon tea – clearly it’ll be enjoyed by many! Chanced upon your blog for the first time. Beautiful cake, beautiful photos! Can’t wait to try out your recipe. Say no to dry cake! My oven is not quite big enough to house 3 8″ layer cake pans. Do you think I can just use a 9″ x 3″ springform pan instead, then slice the layers afterwards? i just made this and it turned out great! right down to the frosting – the first solidly spreadable one i’ve had a chance to try! or maybe i added too little milk :-p anyway, it came out very glossy and sturdy looking. Love this post like a fat kid loves cake. And coincidently it may just turn me into a cake-loving fat kid (as opposed to just cake-loving haha). PS I myself am 19 and don’t know anyone my age who could make such a beautiful blog and still have time for uni and life in general haha, well done! I was wondering where your cake stand was from? Also would you mind telling me how you created your blog? This recipe looks amazing, will try it out myself! Also- do you mean how I designed the site? Well, I used wordpress, created a design, and posted stuff… Nothing too specific. If you’re looking for something more affordable to blog on, there’s also Blogger.com and Typepad. As I stroll through so many recipes trying to find something I felt would knock the socks off my in-laws this year I came upon this recipe. It looks out of this world, I could almost taste the cake as I was reading the ingredients. I really hope it will makes their eyes rollback in their heads when they taste it. One thing I want to know can I use fresh strawberies with that strawberry jell mixture? I wanted to add a little of me in the cake. I’m sure you can maybe add mostly fresh strawberry slices & heat up the jam so it can be brushed over the berries… It would be just as lovely as using homemade strawberry jam. Hi – Just found your blog – I’m going to try this cake for tomorrow. I have made this cake twice in two months and am about to make it again, for my birthday, my daughter’s birthday and now my mom’s birthday. To accomodate dairy and soy allergies, I made the cake and frosting with coconut milk and Earth Balance Soy Free Spread. It is fantastic! My dear friend described it as “the best cake she has ever eaten!” Thank you for this great recipe. :o) It is already a favorite. On the issue of breathtakingly beautiful confections vs. wholesome and comforting desserts: it was a plain looking cake, next to these pretty little designer cupcakes someone else bought, but even though everyone whipped out their cameras to snap those cupcakes, more than half remained untouched by the end of the night. Conversely, no one photographed my homely, humble-looking cake, yet there was only a 2-inch slice of it left. And that, I believe, says all. What a great birthday present… for myself. And yes, I did make my own birthday cake, but am completely fine with that because of your unbelievable recipe. Chocolate and strawberries are my all time favorite flavor combination and this married them beautifully. Thank you again – I already have 2 requests to make for upcoming parties. Just made this for my sons baptism, it turned out great. The strawberry jam adds the moisture that makes this cake perfect! I got rave reviews and I am curious about how what other jams and cakes would go together. Hi this cake looks soo good an I want to make it for my Dad :) But i’d just like to ask if it’s the light kind or the denser side? Because I can’t really see the texture of the cake itself though it look heavenly!!! :) Thanks !! I made this cake for Father’s day. I found the icing a bit sweet, and added extra cocoa powder until it was just right. The cake was delicious! That came out amazingly. Thanks for sharing. I added fresh strawberries in between and on top. It was perfect! I did a search for Choc-strawberry cake and came across your blog. I’m pretty excited to try this out this weekend! Since fresh strawberry season is passed here in VA, I will be using my THRIVE freeze dried Strawberries, and mixing them with strawberry preserves. I love having access to fresh fruit year round!! I also like the hint given above about drizzling some rum over the layers, so I believe I will try that as well. Thanks for making me chuckle at so much bravado over this cake. My taste buds are looking forward to checking it out. This was a huge hit. 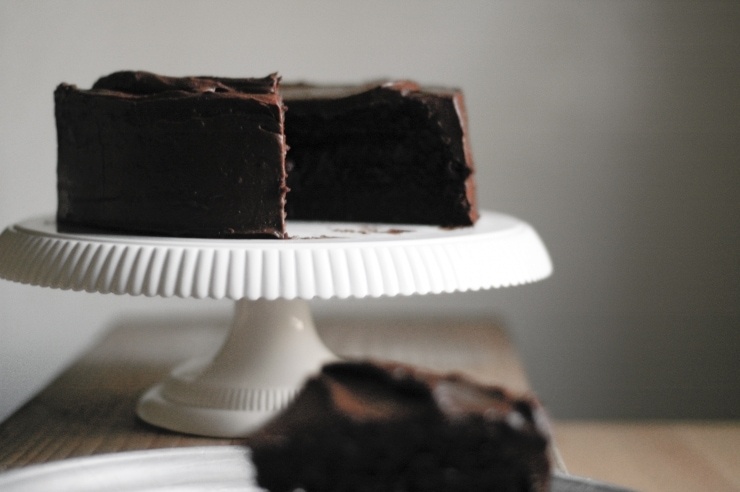 I am always looking for a moist chocolate cake and this is truly it. For the frosting – which has a marvelous, spreadable texture – I added a teaspoon of espresso powder dissolved in just a teaspoon of hot water. This extra step added complexity and made it a little less intensely sweet (which of course some may prefer). Thank you so much. Hi Kamran, I stumbled across your blog when I was searching for a chocolate strawberry cake recipe for my daughter. Her birthday is coming up and she requested this flavour specifically! Thanks for sharing this! dying to make this…….but wondering what the best route would be if I’m making it for a few that don’t care to have their chocolate mixed with fruit?! Will it still be moist if I skip the jam and just use icing? Or what kind of suggestions would you have for a replacement? Hate fondant! Hate clean look! Absolutely mad about “imperfect” cakes! OMG… This cake recipe is awesome! 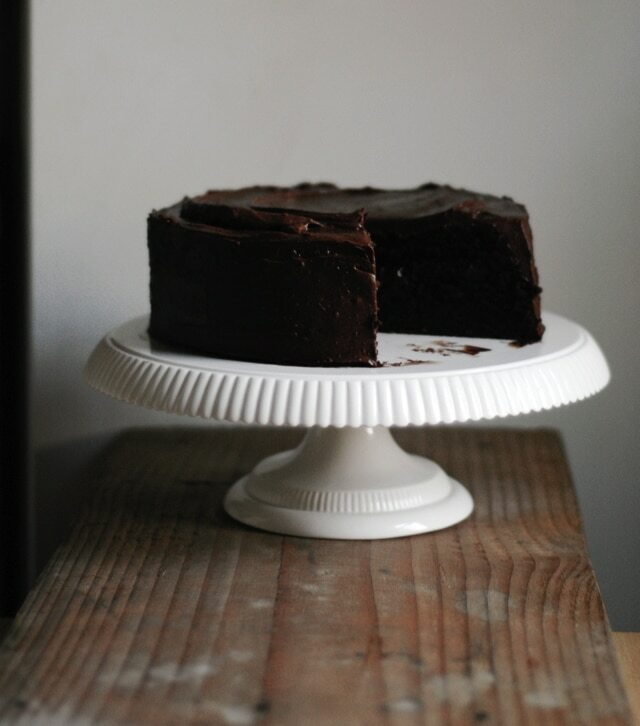 I have been searching for a great chocolate cake recipe for soooo long… I’m sick of eating dry cake and I have made this recipe twice now and it has been really moist both times. I made it for a friends birthday and all of her family commented on how great it was… I will be recommending your recipe to everyone :) I layered with strawberry jam and fresh strawberries and decorated the top with choc dipped strawberries… Yummy! Thank you for sharing! one question though she is allergic to strawberry so will it taste as good with apricot jam? or any other kind of jam? Wow! Kudos! Just made this for my husband as he requested a Chocolate/Strawberry cake. It is to die for! After the first piece of cake, I usually just eat the frosting because I can’t stand how dry the cake can get after sitting for a day. This cake is sooooo moist that I am enjoying the cake, too!! The best cake I have EVER made! This recipe is a keeper. I might try this with raspberry at some point. Just a quick note, I modified using two 9 inch pans and it still turned out beautifully. Also, I LOVED your trick of pressing the cake down to flatten it. Ingenious! Thank you! I have adored your blog for the longest time! Unfortunately we don’t have light corn syrup in Australia, is there a substitute I can use instead? I was just wondering if there was a gluten-free version of this recipe (i.e. swop the wheat flour for a store-bought gluten-free mix)? Would it taste as good? And be as moist? I ask as I’d like to make it for my birthday coming up next week! P.S. Or rather than a gluten-free mix how about ground almonds? OMG this is AMAZING!!! I’m seriously crying as I’m forking my cake. It definitely does not look as clean as your picture but it tastes heavenly!!!! I wouldn’t mind publishing a post or elaborating on a number of the subjects you write about here. Again, awesome blog! made this cake for a girls birthday, dalmatian dog cake decoration, and used your recipe, just changed the filling into strawberry cream, crumb coated with ganache, perfect, perfect, perfect! thanks. Not a fan of these perfectly even, clean and “plastic” cakes either, but it came out clean and perfect!!! Thanks, Kam! This is my go-to quick chocolate cake/cupcakes recipe. I tried this cake today… Used half recipe and it AWSOMEEEE!!!! I made this cake on Sunday for my Mom’s Birthday. I read her and my dad your brag about this cake and they understood why I had to make it. After blowing out the candles I cut everybody a slice, we all sat down and took the first bite together. Unanimous Response- THIS IS AMAZING!!!! My Dad said it was the best cake he’d ever eaten, he’d never even had a piece of cake this good in a restaurant. My husband had 2 giant pieces. The entire cake was gone by the next afternoon. It’s so moist I doubt it would have even dried out over a few days, but we couldn’t resist and were fighting over the last piece. A true gem. Everyone needs this cake in their life. I’m already thinking of what occasion I make this for next. Great job! INCREDIBLE!!! I made this cake for a fairly casual occasion so after baking the three pieces I’ve decided to just put together two and keep the third one separate for us to eat at home. That means I had one two-layer cake filled with strawberry jam and covered in frosting all around, and one simpler cake that had the strawberry jam and frosting only on the top. When i tasted the (smaller) cake right after I finished it, it was good, moist, but a bit too bitter with all the cocoa powder. Also, I didn’t have enough sugar for the frosting (oops!) so I used maybe just one half of the recommended amount. However, the next morning after refrigerating all night, it was AMAZING. The tastes connected very well and the jam was a really nice addition for a fruity person like me. The half-sweet frosting was not a problem, quite the opposite, it received compliments.